Longtime BikeTexas member Jim Kerr spent a lot of time on a bicycle. His death while riding his bike in November 2001 was a blow to us all in Texas, and especially to his friends, those who regularly rode with him, and to his fellow members of the Plano Bicycle Association. His co-workers at Hewlett Packard in Richardson, some of whom were cycling buddies, decided to recognize their friend with a memorial. Together they collected money for a plaque to place in front of a tree at their workplace. 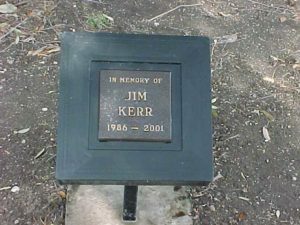 The creating and placing of the plaque in front of a tree is an early tradition that began when the company was Convex Computer Co., a company Jim helped to create. 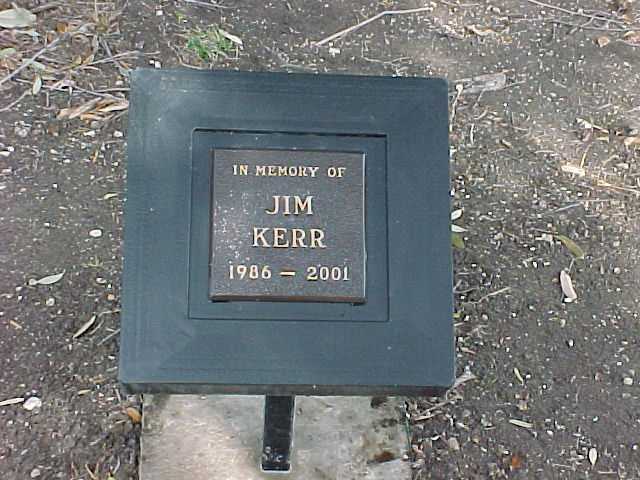 The plaque in memory of Jim includes his name, the date he began work at Convex (now Hewlett Packard) and the date of his untimely death. Jim’s co-workers were so generous that they collected far more money than needed to purchase the plaque and with the remainder of the collection they donated $586.10 to the BikeTexas / Texas Bicycle Coalition Education Fund in Jim’s name. One of his colleagues explained the uneven amount by saying that he had gone through Jim’s desk to collect his personal items and found some loose change, which he added to the collection. We would much rather have Jim riding alongside us but since that isn’t possible, BikeTexas will use this gift given in his memory to train the next generation of vehicle operators. 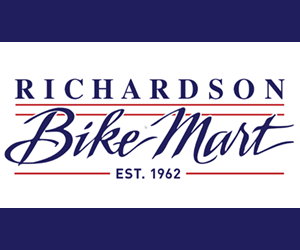 Every dollar BikeTexas receives as a donation to the Education Fund allows us to bring training to one more elementary school child through our Texas SuperCyclist Project. This training will not only make them safer bicycle operators it will hopefully make them safer and more aware motor vehicle operators too. In addition to the generous donation to the BikeTexas / Texas Bicycle Coalition Education Fund from Jim’s colleagues, the Plano Bicycle Association of which he was an active member, sent a donation of $250 to BikeTexas in Jim’s name. 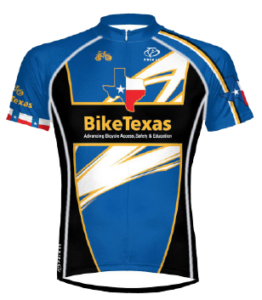 We also want to express our thanks to the Association’s members for supporting BikeTexas on Jim’s behalf. FRISCO – Police in the north Texas town of Frisco are saying they still aren’t sure of the circumstances that led to the Nov. 8 death of Plano cyclist and BikeTexas member James Kerr. Officer Chris Hollahan of the Frisco Police Department said that an intensive investigation shows that Kerr, 42, was probably not the victim of a vehicle-bicycle collision. “There was no physical evidence that backs up the idea that he was hit while he was riding his bicycle,” Hollahan said. “There was no physical evidence that the bicycle was struck by a vehicle, and there was no impact damage to the truck. The truck Hollahan referred to is the vehicle that apparently ran over the cyclist in the dark early-evening hours of Nov. 8 as he lay on Highway 289 a short distance north of Frisco near a small bridge. The driver of the truck never saw Kerr, Hollahan said. The truck driver and other motorists, however, did say they noticed the flashing light that had been attached to the rear of Kerr’s downed bicycle. Hollahan added that Kerr’s injuries were not consistent with those of a person struck by a vehicle while cycling. Preliminary reports from a medical examiner’s autopsy indicated only that Kerr had died as “the result of an accident”, Hollahan said. “In other words,” Hollahan commented, “we only know that he was on the ground before he was run over. We don’t know why he was on the ground.” Hollahan added the Frisco PD investigation had exonerated the driver of the truck. BikeTexas scrutiny of newspapers revealed that six other bicyclists were killed in crashes around the state between October and December.